Quick, tasty and light main meal or lunch that can be whipped up for a tasty weekday dish. –Peel and boil a large sweet potato for around 25 mins or until soft. -Place the sweet potato in a blender, add two tablespoons of Mr Organic Aubergine add in and blend until smooth. -Stir a couple of sprigs of rosemary through the mixture. – Peel and remove the base of the Portobello mushroom. 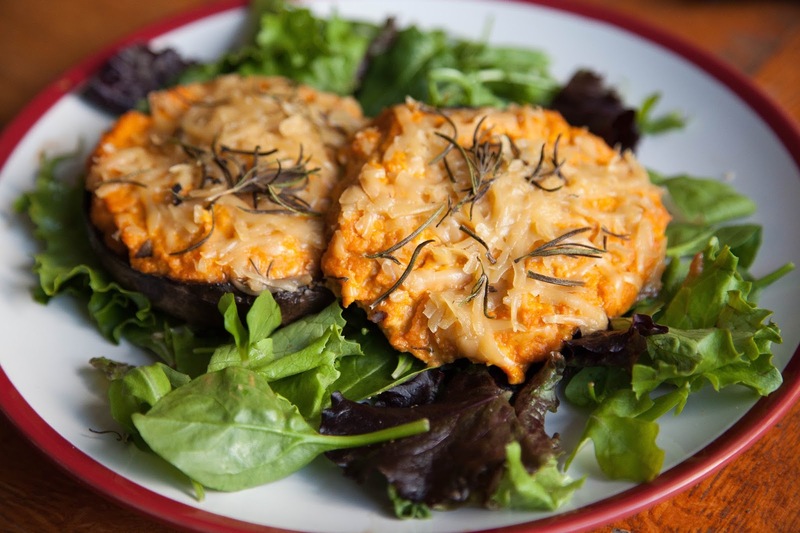 -Upturn the Portobello mushrooms and spoon in the sweet potato mixture. -Sprinkle the top of the sweet potato mix with some Violife and a few more sprigs of rosemary. -Place under a medium heat grill for 10-12mins. -Serve on a bed of salad leaves and enjoy!